Imagine getting the healthy food you want, any time, any place and without standing in line. Seems like something that should be the norm, right? Well if you’re an employee, a student, or any other individual craving fresh food, you’ve most definitely experienced that moment where you have no options. Either you’re studying late at night and the only thing in your building is an outdated vending machine, or you’re working at your job and need something quick to eat, only to find the cafeteria is closed for the day. Also, nothing is worse than going to a grab and go restaurant at an airport or in the city for a fast meal and having to wait twenty minutes in line. We have all been there! Believe it or not, after far too many times leaving those long lines with no food in hand, or feeling guilty and unfulfilled after another bag of ruffles as “lunch,” I started looking into what other options exist today. That’s when I found ShelfX. ShelfX, a company based out of Boulder, Colorado, has been paving the way towards a quicker, smarter, and healthier retail experience. With a thousand fridges in more than 19 countries, it is a low cost solution that uses weight sensing technology to allow consumers to walk up to the fridge, swipe their card, decide which products they want, and after selecting, they just close the door and are charged for the purchase. That’s it. You can purchase as many products as you want, take a look at the product and put it back if you decide it’s not for you. All without having to wait in line and at any time of day. It is a completely self contained unit and can be put absolutely anywhere. So how does it all work? ShelfX works by knowing exactly what’s on the shelf through weight sensing technology and knowing who is in front of it. Most importantly, this highly valuable information is key for those looking to sell the food, and benefits them greatly while easing the consumer’s shopping experience. Whoever purchases a ShelfX unit can monitor their fridge remotely, know exactly what happens when the fridge is opened, see live inventory, indepth sale analytics, as well as setting different marketing features in the fridge such as discounts for certain customers. Employers, for example a hospital, can set discounts so that when an employee uses the fridge, their price is lower than another customer or they can be given a daily allowance. 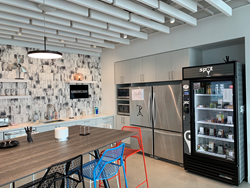 To learn more about ShelfX, I spoke with Ran Margalit, the CEO of the company, who also mentioned that ShelfX’s fridges are “Made by True Manufacturing, the largest fridge manufacturer in the US. The fridges are UL certified, NSF certified for food safety, can process payments in 20 countries, have localization of languages, and follow local rules like EU privacy laws.” He also explained how, “the features available to the person who buys a ShelfX fridge lets them grow their sales exponentially, since they know so much more about their product’s sales and the customers at their fridge.” Other incredible features that Ran mentioned are used today for different customers include facial recognition, advertising videos when a product is lifted, as well as spoken product descriptions. It all seems like the perfect solution and after doing some digging into ShelfX’s competitors, that point was further validated. Recently, there has been a big uproar about Amazon Go and their unattended retail store. The one surprising factor in reading these articles was how journalists were treating it like it was the best, new, thing. When in fact, had they done some further research, they would have found ShelfX has been around and in operation long before Amazon Go. But consistency and a large user base isn’t the only thing that sets ShelfX apart. Their low cost design, ability to stay open 24/7, and completely self sustaining abilities puts ShelfX at a much greater advantage. Amazon Go functions on highly expensive cameras and needs to have someone in the back at all times to make sure everything is going smoothly. Not to mention the line to get in the store seems to defeat the purpose of a cashierless experience. Another common competitor of ShelfX seems to be an RFID solution. I visited an RFID solution at a company to see what the hype was about, only to realize that it’s slow payment processing, expensive sticker tags, and the continual labor costs of putting these stickers on (and the fact that people can remove them and steal items) was nothing close to the ease of using a ShelfX system. The RFID stickers are also incredibly wasteful and are often defective, leading to inconsistent sales. This isn’t to say ShelfX doesn’t have it’s own faults. When speaking further with Ran about this, I learned that some of the challenges ShelfX faces are related to connectivity (staying online 24x7) as well as dealing with backups and support. However, the core technology has been working consistently and even fridges from 5 years ago still stand today, fully operational. One of ShelfX’s largest customers in the United States, Sodexo (one of the world’s largest food corporations) uses the fridges throughout many of their partnered universities, workplaces, gyms and hospitals. Eric Steiner, Senior Product Developer Manager, mentioned how “ShelfX allows us to deliver fresh food to our customers 24X7 and gives us invaluable information about our products being sold.” Another customer, this time in France, named Sodebo, uses ShelfX to sell their convenient lunches and enthusiastically described that, “we want to give people good food without any hassle, and ShelfX does exactly that.”. ShelfX allows the use of meal cards (Ticket Restaurant) that are common in France. After a few times using a ShelfX machine, speaking with the company, and learning about it’s functionalities, I have to say that ShelfX truly is the future of retail, now. There are so many markets in which it can be used and I wouldn’t be surprised if you start seeing it everywhere you go.